For the physical processes that take place at the melting point, see Melting, Freezing, and Crystallization. "Freezing point" redirects here. For other uses, see Freezing point (disambiguation). When considered as the temperature of the reverse change from liquid to solid, it is referred to as the freezing point or crystallization point. Because of the ability of some substances to supercool, the freezing point is not considered as a characteristic property of a substance. When the "characteristic freezing point" of a substance is determined, in fact the actual methodology is almost always "the principle of observing the disappearance rather than the formation of ice", that is, the melting point. For most substances, melting and freezing points are approximately equal. For example, the melting point and freezing point of mercury is 234.32 kelvins (−38.83 °C or −37.89 °F). However, certain substances possess differing solid-liquid transition temperatures. For example, agar melts at 85 °C (185 °F) and solidifies from 31 °C (88 °F; 304 K); such direction dependence is known as hysteresis. The melting point of ice at 1 atmosphere of pressure is very close  to 0 °C (32 °F; 273 K); this is also known as the ice point. In the presence of nucleating substances, the freezing point of water is not always the same as the melting point. In the absence of nucleators water can exist as a supercooled liquid down to −48.3 °C (−55 °F, 224.8 K) before freezing. The chemical element with the highest melting point is tungsten, at 3,414 °C (6,177 °F; 3,687 K); this property makes tungsten excellent for use as filaments in light bulbs. The often-cited carbon does not melt at ambient pressure but sublimes at about 3,726.85 °C (6,740.33 °F; 4,000.00 K); a liquid phase only exists above pressures of 10 MPa (99 atm) and estimated 4,030–4,430 °C (7,290–8,010 °F; 4,300–4,700 K) (see carbon phase diagram). Tantalum hafnium carbide (Ta4HfC5) is a refractory compound with a very high melting point of 4215 K (3942 °C, 7128 °F). At the other end of the scale, helium does not freeze at all at normal pressure even at temperatures arbitrarily close to absolute zero; a pressure of more than twenty times normal atmospheric pressure is necessary. ^ Z is the standard symbol for atomic number; C is the standard symbol for heat capacity; and χ is the standard symbol for electronegativity on the Pauling scale. Many laboratory techniques exist for the determination of melting points. A Kofler bench is a metal strip with a temperature gradient (range from room temperature to 300 °C). Any substance can be placed on a section of the strip, revealing its thermal behaviour at the temperature at that point. Differential scanning calorimetry gives information on melting point together with its enthalpy of fusion. For refractory materials (e.g. platinum, tungsten, tantalum, some carbides and nitrides, etc.) the extremely high melting point (typically considered to be above, say, 1800 °C) may be determined by heating the material in a black body furnace and measuring the black-body temperature with an optical pyrometer. For the highest melting materials, this may require extrapolation by several hundred degrees. The spectral radiance from an incandescent body is known to be a function of its temperature. 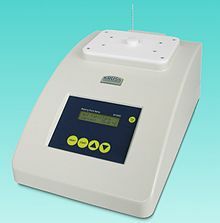 An optical pyrometer matches the radiance of a body under study to the radiance of a source that has been previously calibrated as a function of temperature. In this way, the measurement of the absolute magnitude of the intensity of radiation is unnecessary. However, known temperatures must be used to determine the calibration of the pyrometer. For temperatures above the calibration range of the source, an extrapolation technique must be employed. This extrapolation is accomplished by using Planck's law of radiation. The constants in this equation are not known with sufficient accuracy, causing errors in the extrapolation to become larger at higher temperatures. However, standard techniques have been developed to perform this extrapolation. Consider the case of using gold as the source (mp = 1063 °C). In this technique, the current through the filament of the pyrometer is adjusted until the light intensity of the filament matches that of a black-body at the melting point of gold. This establishes the primary calibration temperature and can be expressed in terms of current through the pyrometer lamp. With the same current setting, the pyrometer is sighted on another black-body at a higher temperature. An absorbing medium of known transmission is inserted between the pyrometer and this black-body. The temperature of the black-body is then adjusted until a match exists between its intensity and that of the pyrometer filament. The true higher temperature of the black-body is then determined from Planck's Law. The absorbing medium is then removed and the current through the filament is adjusted to match the filament intensity to that of the black-body. This establishes a second calibration point for the pyrometer. This step is repeated to carry the calibration to higher temperatures. Now, temperatures and their corresponding pyrometer filament currents are known and a curve of temperature versus current can be drawn. This curve can then be extrapolated to very high temperatures. In determining melting points of a refractory substance by this method, it is necessary to either have black body conditions or to know the emissivity of the material being measured. The containment of the high melting material in the liquid state may introduce experimental difficulties. Melting temperatures of some refractory metals have thus been measured by observing the radiation from a black body cavity in solid metal specimens that were much longer than they were wide. To form such a cavity, a hole is drilled perpendicular to the long axis at the center of a rod of the material. These rods are then heated by passing a very large current through them, and the radiation emitted from the hole is observed with an optical pyrometer. The point of melting is indicated by the darkening of the hole when the liquid phase appears, destroying the black body conditions. Today, containerless laser heating techniques, combined with fast pyrometers and spectro-pyrometers, are employed to allow for precise control of the time for which the sample is kept at extreme temperatures. Such experiments of sub-second duration address several of the challenges associated with more traditional melting point measurements made at very high temperatures, such as sample vaporization and reaction with the container. Pressure dependence of water melting point. For a solid to melt, heat is required to raise its temperature to the melting point. 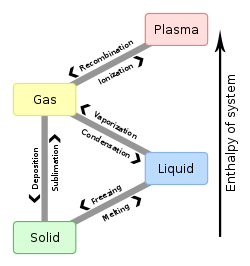 However, further heat needs to be supplied for the melting to take place: this is called the heat of fusion, and is an example of latent heat. In organic chemistry, Carnelley's rule, established in 1882 by Thomas Carnelley, states that high molecular symmetry is associated with high melting point. Carnelley based his rule on examination of 15,000 chemical compounds. For example, for three structural isomers with molecular formula C5H12 the melting point increases in the series isopentane −160 °C (113 K) n-pentane −129.8 °C (143 K) and neopentane −16.4 °C (256.8 K). Likewise in xylenes and also dichlorobenzenes the melting point increases in the order meta, ortho and then para. Pyridine has a lower symmetry than benzene hence its lower melting point but the melting point again increases with diazine and triazines. Many cage-like compounds like adamantane and cubane with high symmetry have relatively high melting points. Like many high symmetry compounds, tetrakis(trimethylsilyl)silane has a very high melting point (m.p.) of 319-321 °C. It tends to sublime, so the m.p. determination requires that the sample be sealed in a tube. An attempt to predict the bulk melting point of crystalline materials was first made in 1910 by Frederick Lindemann. The idea behind the theory was the observation that the average amplitude of thermal vibrations increases with increasing temperature. Melting initiates when the amplitude of vibration becomes large enough for adjacent atoms to partly occupy the same space. The Lindemann criterion states that melting is expected when the vibration root mean square amplitude exceeds a threshold value. In February 2011, Alfa Aesar released over 10,000 melting points of compounds from their catalog as open data. This dataset has been used to create a random forest model for melting point prediction which is now freely available. Open melting point data are also available from Nature Precedings. High quality data mined from patents and also models developed with these data were published by Tetko et al. ^ The melting point of purified water has been measured as 0.002519 ± 0.000002 °C, see Feistel, R. & Wagner, W. (2006). "A New Equation of State for H2O Ice Ih". J. Phys. Chem. Ref. Data. 35 (2): 1021–1047. Bibcode:2006JPCRD..35.1021F. doi:10.1063/1.2183324. ^ Agte, C. & Alterthum, H. (1930). "Researches on Systems with Carbides at High Melting Point and Contributions to the Problem of Carbon Fusion". Z. Tech. Phys. 11: 182–191. ^ The exact relationship is expressed in the Clausius–Clapeyron relation. ^ "J10 Heat: Change of aggregate state of substances through change of heat content: Change of aggregate state of substances and the equation of Clapeyron-Clausius". Retrieved 19 February 2008. ^ Brown, R. J. C. & R. F. C. (2000). "Melting Point and Molecular Symmetry". Journal of Chemical Education. 77 (6): 724. Bibcode:2000JChEd..77..724B. doi:10.1021/ed077p724. ^ Lindemann FA (1910). "The calculation of molecular vibration frequencies". Phys. Z. 11: 609–612. ^ Sorkin, S., (2003), Point defects, lattice structure, and melting, Thesis, Technion, Israel. ^ Philip Hofmann (2008). Solid state physics: an introduction. Wiley-VCH. p. 67. ISBN 978-3-527-40861-0. Retrieved 13 March 2011. ^ Predict melting point from SMILES. Qsardb.org. Retrieved on 13 September 2013. ^ ONS Open Melting Point Collection. Precedings.nature.com. Retrieved on 13 September 2013. ^ OCHEM melting point models. ochem.eu. Retrieved on 18 June 2016. ^ Tetko, Igor V; m. Lowe, Daniel; Williams, Antony J (2016). "The development of models to predict melting and pyrolysis point data associated with several hundred thousand compounds mined from PATENTS". Journal of Cheminformatics. 8. doi:10.1186/s13321-016-0113-y. PMC 4724158.